I met him at a Starbucks outside the Tower of London. It was pre-arranged. I had told him I was an independent blogger. He told me he preferred to talk to independent writers these days; the mainstream media was more trouble than what it was worth. It helped that I wrote for a site that he regularly read and admired. The complexities of the London tube have thwarted me on more than one occasion, and this time was no different. I was a full fifteen minutes late. He was sitting in a cafe, his signature fedora on his head, but still dressed inconspicuously enough so as to seem like one of the many people thronging the cafe. We passed several tourists on our way inside the Starbucks. Inside, we ordered a regular coffee for Vidia and, for me, an American bastardization I had gotten used to since my graduate school days – a caramel macchiato. Vidia insisted on paying. Then, with a conspiratorial wink at me and the barista – a woman who seemed like she had been around since before the advent of coffee shops – Vidia started toward the direction of the restrooms. “Come with me”, Vidia said, leading the way. I was a bit confused: weren’t we supposed to get a table either inside or outside, where the weather was gorgeous, especially for a London summer? But I followed his lead. At the very end of the hallway in which the restrooms were located Vidia stopped. Making sure nobody was around he pressed what seemed like a small photo frame of a bucolic mountain landscape hung on the wall. Suddenly the narrow wall swung open, and with a quickness belying the girth of his aging figure, Vidia disappeared into the void and beckoned me in. I was too stunned to say anything, and I followed him almost as a reflex action. The door in the wall swung back and closed as fast as it had opened, and a bright light suddenly illuminated the hallway. I still remained rather stunned to say anything. There was another brown door at the end of the hallway. Vidia walked up to it and knocked. A few seconds later the door opened. Nadira Naipaul was gently smiling at us and welcomed us in. She was warm and welcoming, the picture of grace. “Nadira, we have a guest with us today”. Vidia introduced me and briefly told Nadira about my background. I followed the two of them into the living room. The elegance of the room belied its simplicity. The walls were cream colored and easy on the eyes, and photos of various and sundry landscapes hung on the wall; a street scene in Trinidad, a sea of grass from England’s Lake District, and a weekend market in Agra with the Taj Mahal in the background. The apartment behind the wall seemed spacious. What caught my eye the most, however, was the low-slung Japanese table in the middle. Of course, I said. I sat on one side, Vidia on the other. Nadira asked me if I would like some tea and went inside to fetch some. “So, what is it that you wanted to talk about?” Vidia asked. “Well”, I said, “I must give you some personal background regarding why I wanted to bring up this specific topic.” Vidia indicated that he wanted me to continue at length. Glad to hear that he empathized with my thoughts regarding identity, I suddenly noticed Nadira standing next to us, holding a tray on which teacups made of elegant China were kept. I took a cup and added two spoonfuls of sugar in spite of the warnings about diabetes from my doctor; I wanted to make sure I was alert and attuned to anything Vidia was saying. “Can I join both of you?”, Nadira asked, “Of course”, I said. Company this charming was always welcome. “Yes, there is something to be said about the challenge of adopting to your new culture while being true to yourself.”, said Vidia, empathizing with my sentiment. “Yes, as much as they try to deny it, not even those fervent evangelicals that I saw at the 1984 Republican convention in Dallas can escape from these multiple layers of identity!”, said Vidia. Nadira laughed. “We feel the same way. Make sure you send us your article, please.”, Vidia said. After bidding him and Nadira goodbye, he again walked me through the secret passageway and pressed a little button that opened the door in the wall. I grasped his hand and said goodbye, and made my way through the dimly lit Starbucks. Opening the door, I stepped out into the London night. The city was still alive, its multiplicity of identities glowing with anticipation. Note: I never met V. S. Naipaul, although I am sure I would have loved to. But I did have a delightful dream about meeting him, about the secret passageway at the end of which was his home, about his charming wife Nadira, about a vigorous discussion about identity and his book The Enigma of Arrival (which, after waking up, I read enthusiastically). This is an elaboration of that dream. 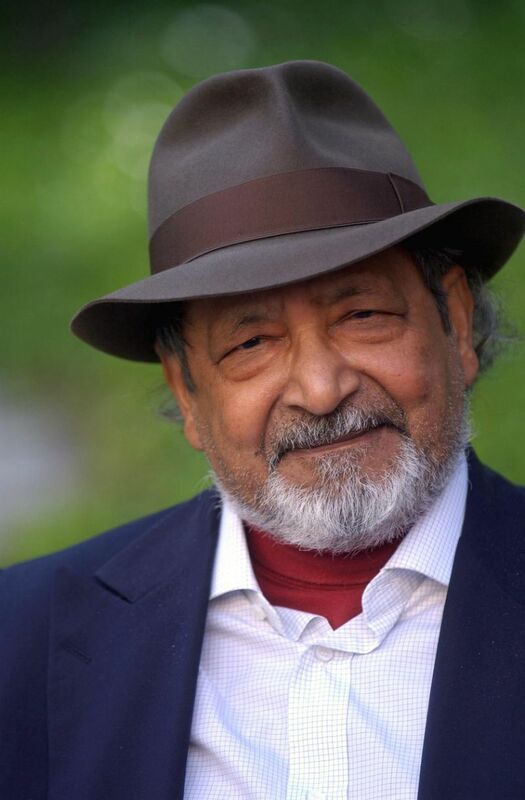 RIP, V. S. Naipaul. This post was first published on 3 Quarks Daily.